Digital radiography is a form of X-ray imaging, where digital X-ray sensors are used instead of traditional photographic film. 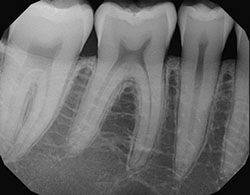 Digital radiography (digital x-ray) is the latest technology used to take dental x-rays. Advantages include time efficiency through bypassing chemical processing and the ability to digitally transfer and enhance images. Also less radiation can be used to produce an image of similar contrast to conventional radiography. Dental x-rays are essential, preventative, diagnostic tools that provide valuable information not visible during a regular dental exam. Dentists and dental hygienists use this information to safely and accurately detect hidden dental abnormalities and complete an accurate treatment plan. Without x-rays, problem areas may go undetected. X-rays can show cavities, hidden dental structures (such as wisdom teeth), and bone loss that cannot be seen during a visual examination. How often X-rays should be taken depends on each patient's individual dental health needs. Your dentist and dental hygienist will recommend necessary x-rays based upon the review of your medical and dental history, your present oral health, any signs and symptoms of oral disease, your age, your risk of disease. A full mouth series of oral x-rays is recommended for new patients when the patient has clinical evidence of generalized oral disease or a history of extensive dental treatment. A full series is usually good for three to five years. Bite-wing x-rays (x-rays of top and bottom teeth biting together) are taken at recall (check-up) visits and are recommended once or twice a year to detect any new dental problems. 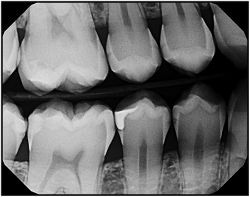 An individualized radiographic examination usually consists of posterior bitewings with panoramic examination or posterior bitewings and selected periapical images.